HUBBLE LIVES! Back in May, astronauts visited the Hubble Space Telescope to install new hardware and make repairs to the aging observatory. The upgrades were a sucess. To prove it NASA today released spectacular first images from the rejuvenated Great Observatory. Get the full story from Science@NASA. "The shuttle put on a major light show," says Perry. In Madison, Wisconsin, photographer Abe Megahed witnessed a similar display: "The shuttle was sporting a massive curved plume. What could it be? Something venting? Reaction Control System thrusters? A massive, record-breaking urine dump?" Stop laughing. Shuttle pilot Kevin Ford was indeed scheduled to carry out a number of "waste water" dumps over a several hour period around the time of these observations. Pristine water supplies and condensates were also dumped overboard in preparation for landing on Thursday, Sept. 10th. Thursday's landing opportunities at the Kennedy Space Center begin with a planned deorbit burn at 5:59 p.m. EDT and a daylight landing at 7:05 p.m. The next opportunity is one hour after sunset with the deorbit burn at 7:36 p.m. EDT and a landing at 8:42 p.m. EDT. 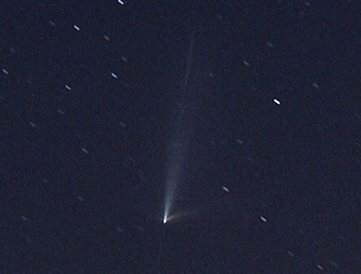 Check the Simple Satellite Tracker for last-chance flybys. 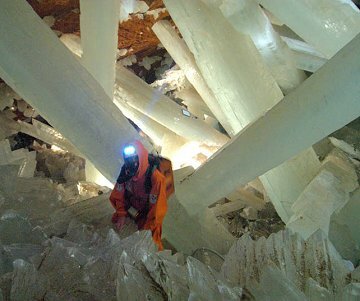 Three hundred meters below Naica lies an alien world of giant crystals and nearly unbearable heat. "With an air temperature of 122 F and a relative humidity of more than 90%, it feels like 228 F in the cave," says Kourounis. "To survive in this extreme environment, we enter the cave wearing special suits with cooling packs inside and a backpack respirator which allows us to breath chilled air. Even with all this equipment, I will still be able to stay in the cave for no more than 45 minutes at a time." Unprotected, even a scant 10 minutes could prove fatal--and that is why this amazing cavern discovered by miners nine years ago remains relatively unexplored. "Some of the crystals are 11 meters long and weigh as much as 55 tons," marvels Kourounis. "We had to be extremely cautious not to slip and fall. Doing so could get you impaled." "Wearing the suit," he adds, "you feel like an astronaut who is about to go on a space walk." Make that an inner space walk. Click here for more pictures and anecdotes from the Cave of Crystals. On September 10, 2009 there were 1068 potentially hazardous asteroids.